With the growing trend of online services and business, organizations are coping with the growing demand of their online presence. Using the same SSL certificate for all business can result into high cost and cumbersome management, especially when it is a question of multiple domains, organization has to think out of the box and go with certificate that can provide a single protection to all domains. In this short and useful information, we will talk about SAN (Subject Alternative Name) certificate. SAN Certificate is an extension of x.509 certificate just after 2007. Since Microsoft Exchange server is arrived, SAN is used to secure multiple sites across different domains and sub domains. SAN is also named UCC (Unified Communications Certificate) that is able to protect multiple host names and domain names with a single certificate. Many SSL providers allow organization to secure up to 100 SANs with a certificate. When you purchase SAN certificate, you will have few advantages that would make your SAN purchase worthy. Domain Flexibility: A single SAN can secure multiple domains and sub domains with up to 256-bit encryption that will boost online security. 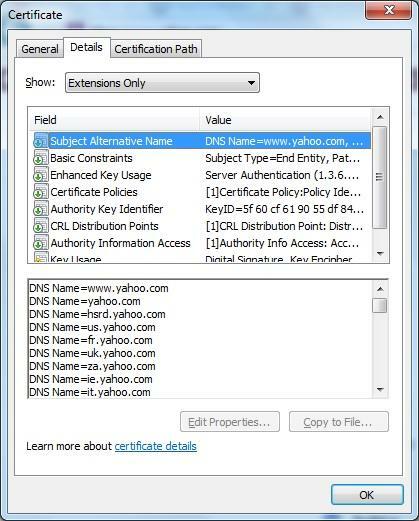 A buyer selects default pack of domains and later on, he can add up to 100 domains during the life-cycle of a certificate. 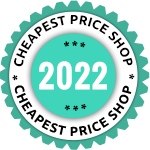 Cost Effective: When you purchase individual certificate for each domain, it will be costly and requires caution and much time in installation. With SAN, a buyer will never face high cost and get a single certificate solution for all domains. Server Compatibility: SAN/UCC certificate is renowned as exchange server certificate and ideal for MS Exchange server 2007, 2010, 2013 and MS Live Communication Server. SAN certificate is perfect for shared hosting and is compatible with server and client OS, web servers, and cPanel. 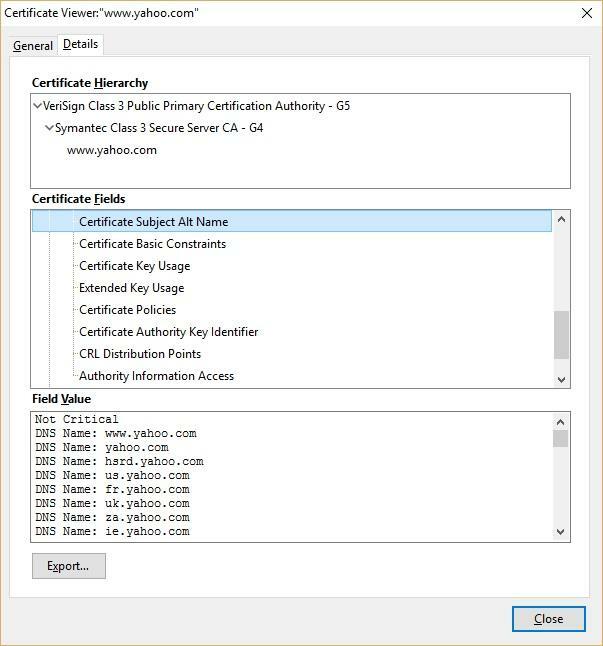 Easy certificate Management: Instead of managing multiple certificates, IT admin will have to take care of a single certificate therefore; there will be less chances of lapse of certificate renewal, expiry of certificate. SAN offers easy installation and effective certificate management. How you can find SAN in Browser? Visitor or customer can find details of SAN certificate in IE browser by clicking on green padlock in address bar. Click on View Certificate and go to “Details” tab. Browse Subject Alternative Name in list. In Firefox, click on green padlock, you will see a box with your verified domain name. Here, click on the arrow beside your domain name and you will see More information tab, just click on it. 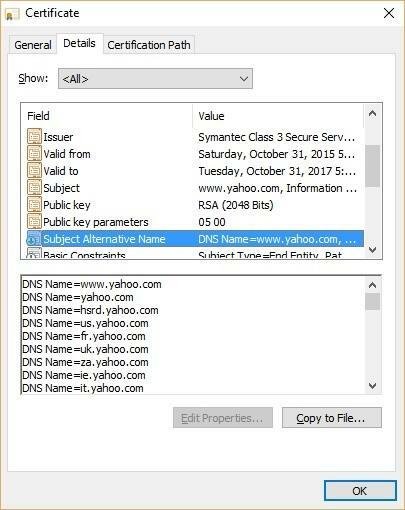 Under security tab, click on view certificate>> Details>> Certificate Fields>> Certificate>> Extensions>> Certificate Subject Alt Name tab, and you will see SAN details in listed stuffs. Click on Green Padlock>> click on Details link. Click on View Certificate>>now under Details tab. You will find Subject Alternative Name. Many individuals are confused between wildcard and SAN certificate. However, both certificates can be differentiated by their features and functions. Below is a given difference between wildcard and SAN. 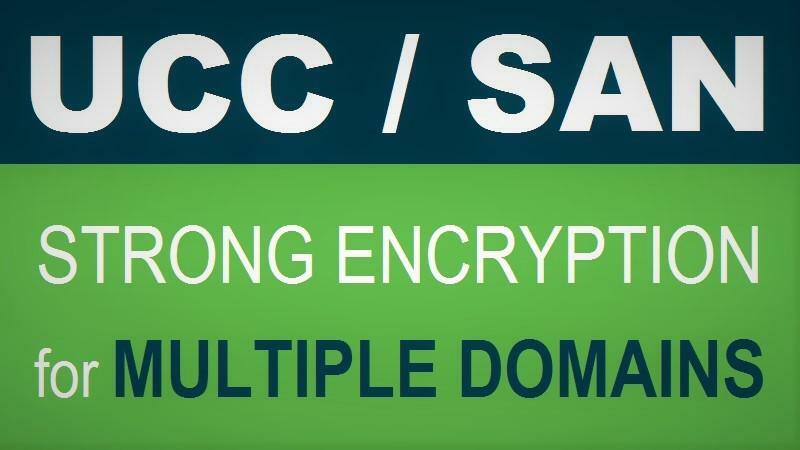 On contrary, SAN certificate is ideal for securing multiple domains and sub domains therefore; if a website owner wishes to secure his number of domains. When it is a question of server compatibility, SAN wins the game, as it is the most compatible with different servers. Both wildcard and SAN certificate are great in saving cost of a business and offers a smooth certificate installation and administration. Read Wildcard SSL vs SAN SSL in detail. 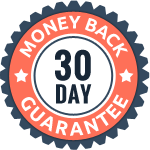 SAN certificate is overall a cost saving certificate and offers flexibility in domain protection. When you apply for SAN certificate, you will have unlimited re-issuance, robust encryption, warranty that makes the purchase valuable. Days are gone, when SAN certificate was available at higher cost currently, a business of any size can get it at affordable price and secure the business within few days. You will have combination of modern technology and strong encryption with SAN SSL certificate at lowest price.